I wonder why they didn’t build two Skyhouse towers like they are doing in Charlotte instead of these stick-built apartments. Their would still be a plot of land they could use for a future development, like with the Edison office tower. I wonder what the construction cost is for this vs for Skyhouse. I think they only thing worse than these waste of the space apartments (which probably won’t look half bad, honestly) would be to have the same odd, unfinished-looking Skyhouse on both sides of the block. @James: I think that the cost difference was about $11-$15 million. Which is why I asked myself the same question: Why the Hell didn’t they build another Skyhouse? 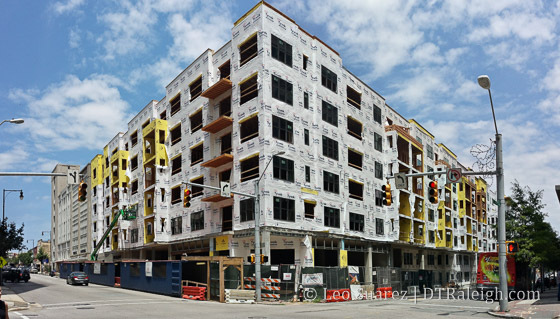 Sure, the developer cannot build more than one, in a city like Raleigh, within a short time from the first one. Charlotte is a larger market, though, and more tested. I think Skyhouse looks terrific where it is, with what it does; serves it’s purpose, and is much taller than the standard 5-7 story boxes we see on the regular. We’re not in a position to really gripe about the structures that are actually being built over 20 stories. We just have to be grateful and hopeful that the magnitude of the completed tower will spur other developer and investor interest. As for all of the little stick apartments, we have every right to be picky. If you’re going to waste space on prime real estate, the least you can do is make it look amazing. Or better yet, don’t build it until you find a way to fund something taller.